The Big Game is right around the corner and in my house, there is nothing like a great football game. Whether a team I like is playing or not, there is always an energy in the air the day of the game. I love having my closest friends and family over for good food, drinks, and plenty of yelling at the TV. Decor for the game is important–you want to make the theme fun, but you don’t want to spend a lot of money or a lot of time cleaning up. 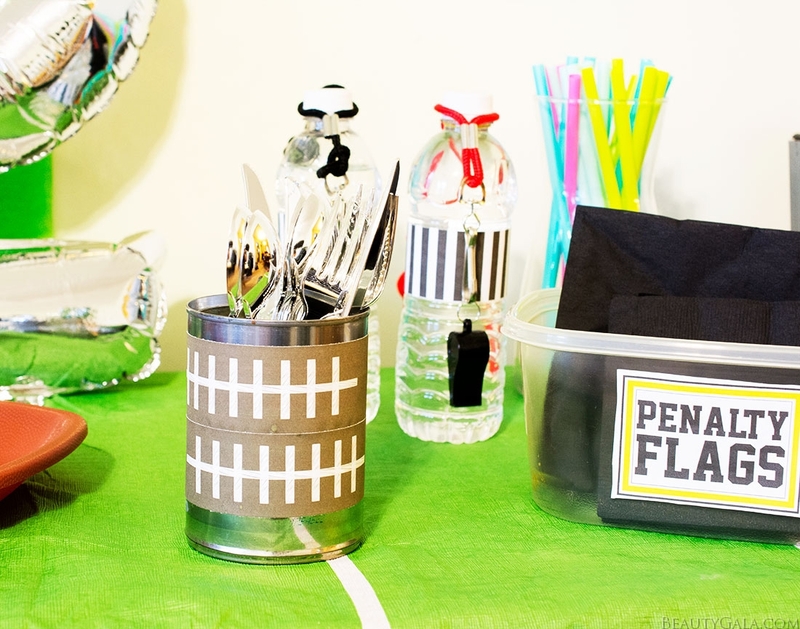 I’ve got some super cute do-it-yourself decor ideas for the Big Game that you, too, can easily execute. This accessory table has everything you’ll need to make the food, drinks, and big game both easy and great. So how does it work and why do I keep these handy? It’s simple! You spritz Poo~Pourri into your toilet bowl where the pure blend of natural essential oils creates a film on the surface of the water. This film actually traps odors underneath the surface of this barrier, keeping your restroom smelling so fresh and so clean. If this stuff had been invented when I was in middle school and high school, I would have felt much more comfortable anywhere I went. I carry one of these around with me in my purse at all times and have for years now. For me, in my home, comfort is number one, and Poo~Pourri gives everyone an extra convenience. You can hover over the image above to start shopping for your Big Game party guests! I always like to include inflatable balloons of what number Big Game it is. If you’re taking pictures at the party, you’ll want to remember which year and which game it was, and that can be hard when all the years blur together so quickly as time goes by. 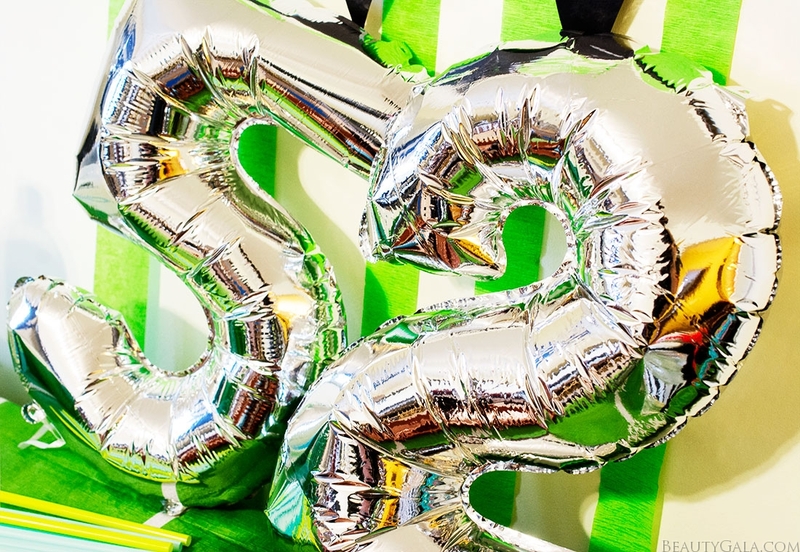 You can easily purchase number balloons that you can inflate with a straw and your own breath. Each number cost me under $1 and it’s a shiny way to remember the exact game. For easy cleanup, disposable silverware and napkins are always easiest, but they don’t have to be boring. For napkins, buy your team colors or yellow ones and print out a banner that says “Penalty Flags” on it. I glued mine to a plastic food container and I thought it looked really unique and cute. For the silverware, I took a can that I had already used the contents of, rinsed it out, and took off the original label. I printed out some football-themed strips (you can also use brown paper and white tape) and glued them around the can. It instantly jazzes up the silverware container(s) and it was done for pennies. There’s nothing worse than having a million cups all over your house the night after a party. 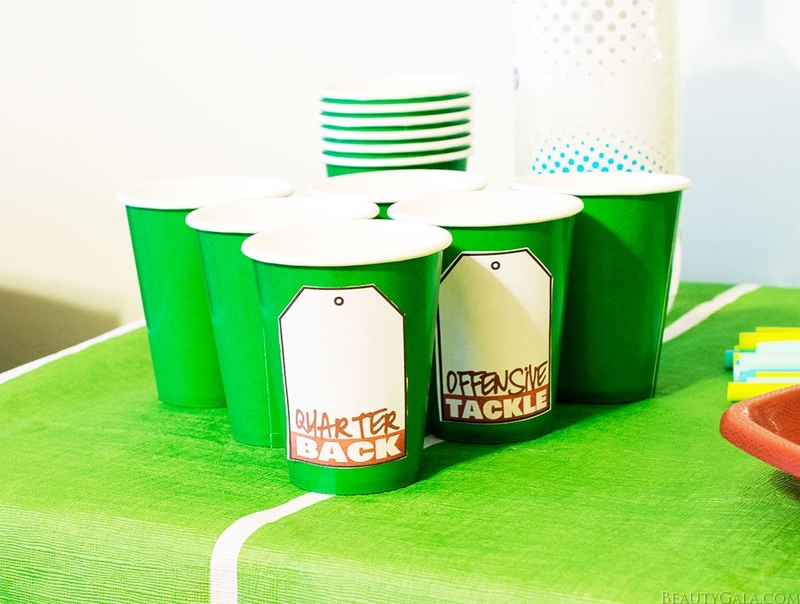 Keep everyone’s cups organized in a fun way by printing out football position tags. I found these online, printed them out, and glued them to some disposable cups. Keep a permanent marker nearby so guests can write their own names on their cups. It’ll also be fun to see who chooses what position for their cups! Staying hydrated during the game doesn’t have to be boring. 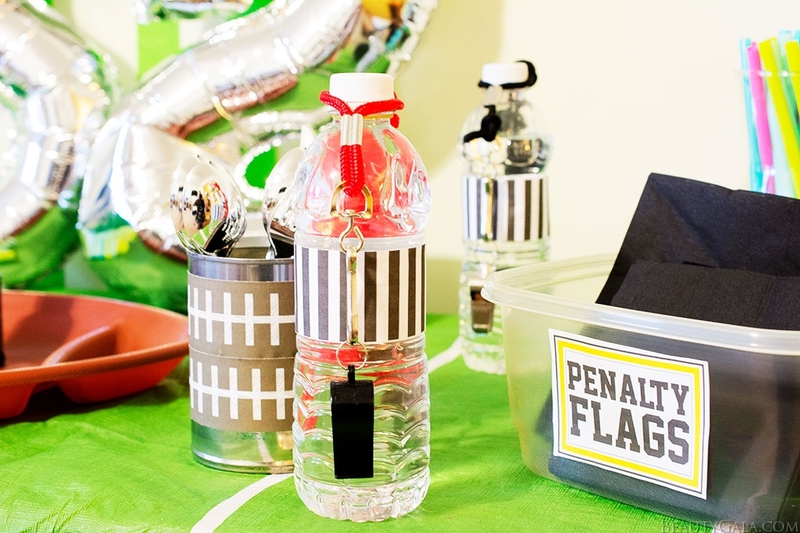 Print out black and white stripes, cut them into strips, and wrap them around water bottles. To make them even more official, grab some inexpensive whistles and wrap them around the bottle caps. You can easily find inexpensive party favor whistles at your local party store. Just be aware, you may want to revoke the whistles from some of your guests later on in the night if they start driving you crazy! Besides all my of decor ideas being budget-friendly, they also happen to keep all the items people will be grabbing for all night long away from the food and the TV. This allows your guests to conveniently grab what they need and get on with having a wonderful time. 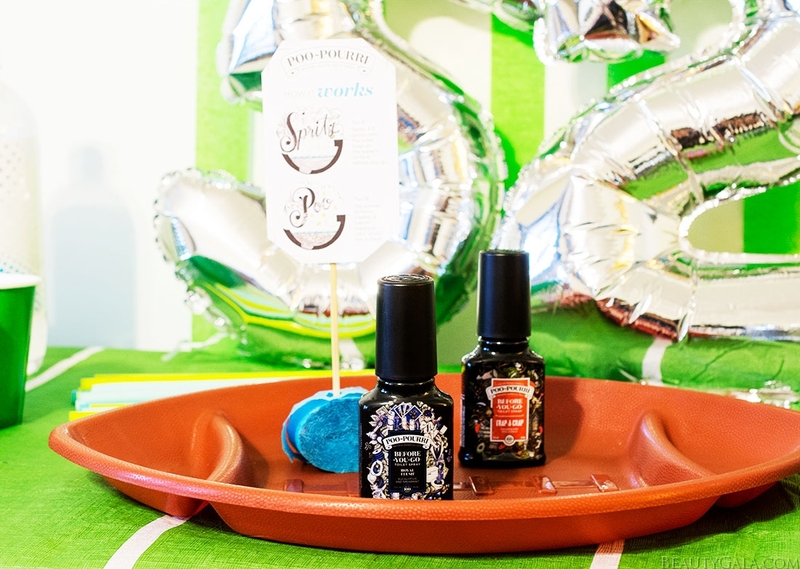 If you’re hosting the Big Game, don’t forget about the other bowl and put some Poo~Pourri out for your guests. It’s guaranteed to be a conversation starter and your bathroom will thank you for it! Checkout is easy on Poo~Pourri’s website, and you can also use the Store Locator to find a retailer that stocks and sells the products near you. Online checkout for me was super fast and easy. I paid for overnight shipping and my product arrived to me within 36 hours, which was lightning quick. Shipping is always free over $19.95. 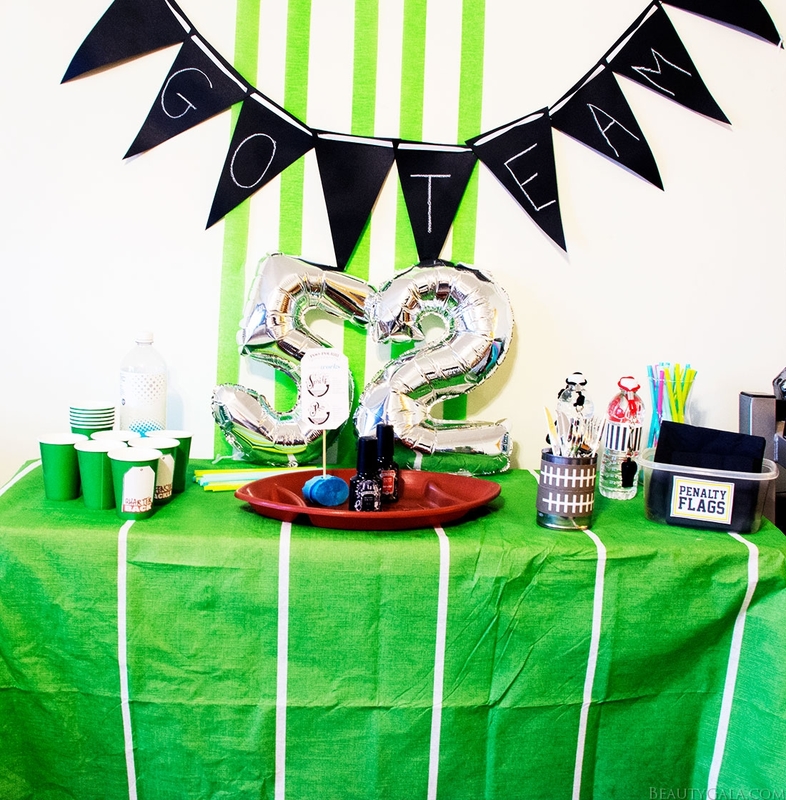 Are you hosting a party for the Big Game this year? Leave me a comment below!